During a day I come across a lot of interesting blog posts, websites, tweets and links. But I’ll also be the first to admit I don’t have time to read them all. I’m subscribing to a lot of RSS feeds, and frankly, just opening my RSS reader made me feel dejected. Add to that all the cool stuff people post on Twitter that I don’t want to miss out on. Because basically it boils down to that, the fear of missing out. Missing out on great tips, a nice write-up, a new innovation or a review. In fact, it came to a point where I was simply just de-bolding links to ease my anxiety over a couple of hundred unread items. Armed with my iPhone and my Mac I was already using Tweetbot instead of Twitter’s own app. And I had only just heard of an app called Pocket, which turned out to be just perfect to save articles I found through Twitter during the day. Then simply click “Send to Pocket” to save it. Hey presto! Make sure you install Pocket in your browser as well. Available as an extension for Chrome and add-on for Firefox. Whenever you stumble upon something worth reading, just click the Pocket icon. Next on the agenda was RSS. I started by throwing out Net News Wire as my RSS reader. I had used, and loved that app, for years but it lacked functionality I needed. As a replacement I got myself a copy of Reeder from the App Store for just $5. I set up its service so that I can send posts to both Pocket and Evernote if I want to. 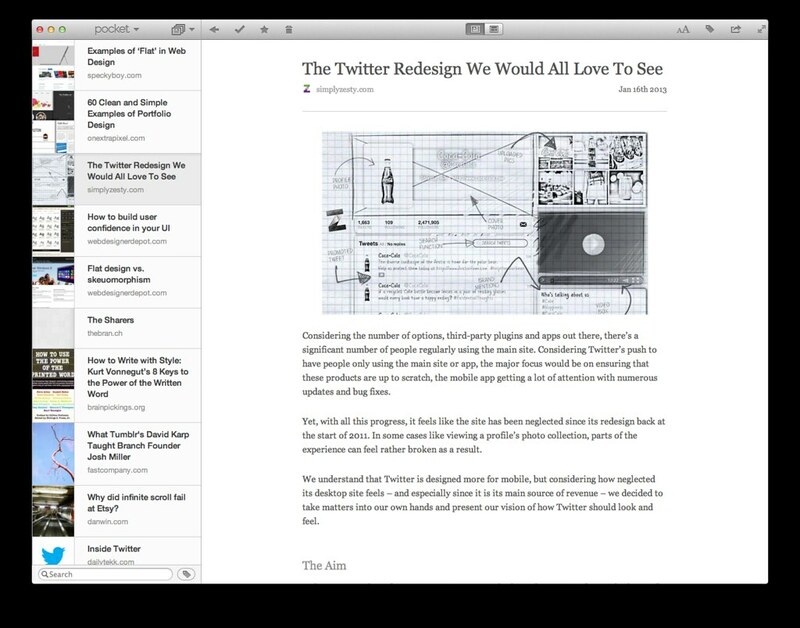 No time spent in the RSS reader during the day, save anything interesting for later in Pocket. Between saving articles and tweets I come across during the day, as well as sending stuff from Reeder, my reading is curated automagical in Pocket. Come evenings and weekends, I open the Pocket app on my laptop or iPad and get reading. From inside Pocket I can share my reading with friends via Twitter, Facebook, e-mail and whole range of other ways. I can tag articles if I want, archive them or simply delete them when I am done reading. For me this is a much relaxed way of reading. A bit like your own magazine, with the content of your choice. I think being realistic about how much you can consume is paramount. It probably mean deleting or filtering out a large portion of your feeds to find the right balance. But if you’re frustrated with your reading, this might be a good way to go.